Projects Abroad is launching a brand new project aimed at providing experience to young interns planning on working in the medical field. 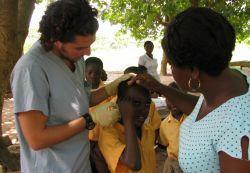 The Pre-Med project consists of 3 days medical outreach work per week and 2 days observation in a local hospital or clinic in Ghana. During the outreach work, interns will learn how to treat minor injuries and ailments, check vital signs, test blood glucose, and carry out malaria testing. You will also take part in awareness campaigns in schools and communities to highlight particular health issues. This project, based in Cape Coast, starts in July this year and offers interns lacking medical experience the chance to get hands-on work while helping those in need. This is the perfect opportunity to immerse yourself in a different culture and offers a fantastic insight into how local procedures and patient support are carried out in a developing country compared to back home.